It's perhaps a bit early to stare too hard at the ladders but here we present the complete set after Round 1 of the 2014 AFL International Cup. The Women's is straight forward but the Men are divided into 3 pools, with the complication being that the top 4 that go through to the semi-finals after 3 rounds are the top of each pool and then the next best based on combining all the teams - hence we've also shown a Combined ladder. 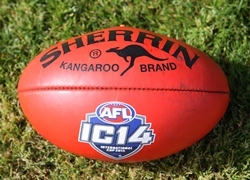 That will also determine the teams that make what the AFL has called Division 1, i.e. teams 5 - 12, and Division 2, i.e. teams 13 to 18. There are, as always, some bizarre percentages, due to lopsides matches and not in a small way because we've stuck to the AFL / Victorian way of calculating percentage, which is now spreading throughout Australian football throughout the world, namely points for divided by points against multipled by 100, rather than the conventional maths of for divided by (for plus against) multipled by 100. So the % means per 100 points scored by the opposition, not per 100 points of the total scores.